The MS462xA, a member of the Scorpion Vector Network Measurement System (VNMS) family, is the economical choice for transmission/reflection analysis. 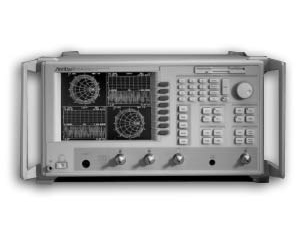 The A model has a very popular 2-port configuration that is available in the frequency ranges of 10 MHz to 9 GHz (or 3 or 6 GHz). Your investment in the MS462x is always protected by the ability to easily upgrade to higher functionality or higher frequency. Standard features on all models are the capability to view up to four S-parameters simultaneously, both GPIB and Ethernet connections, alternate sweep mode, and the ability to internally create, edit and execute test sequences. The ability to calibrate for flat test port power and then execute a fully calibrated power sweep is also standard on all network analyzers.